Turmeric Teas : Health Benefits and Everything You Need to Know! Nature has been pivotal in the evolution of the human race. Having evolved alongside us, the existence of plants and their respective natural products can be dated back to a billion years from today. Many of these natural products have been proven to have pharmacological and medicinal properties, which were one of the key sources of ancient medicine and healing tactics. Medicines derived from these plants have time and again have had a significant impact on developing health care systems across various cultures. For example, the Indian study of holistic medicine, widely known as ‘Ayurveda’. Dating back to thousands of years, Ayurveda is the study of using plant-based derivatives to formulate medicines to treat a variety of ailments and diseases. Today we shall peek into the world of Ayurvedic superblend with focus on Turmeric tea and the endless health-promoting benefits attached with turmeric! Turmeric is a product of Curcuma longa, a rhizomatous herbaceous perennial plant belonging to the ginger family and native to Southeast Asia. 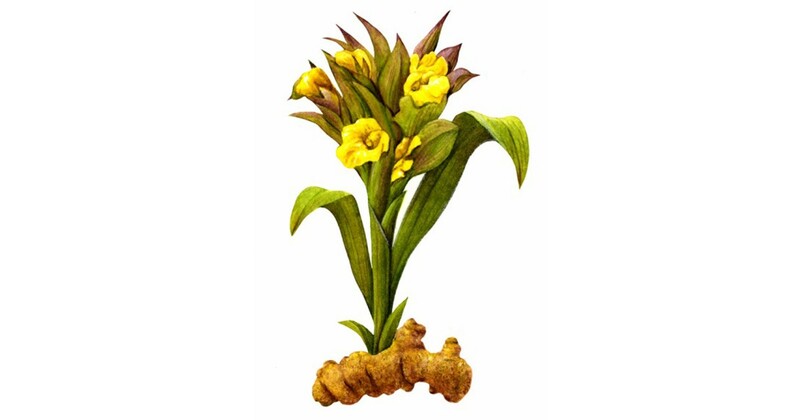 The whole turmeric is a tuberous rhizome which has a rough outer skin. The main rhizome inside has a yellow and dull orange color, which on being grounded produces a bright yellow powder — the more popular version of Turmeric. Typically, the plant requires a temperature of 20 °C and 30 °C and requires a good amount of rainfall in a year. Individual plants have reed-like stems with long oblong leaves. The plant can grow up to 2m in height. Turmeric takes eight to ten months to mature, usually in warm weather, and can be harvested once in a year. Turmeric is one such wondrous root that has been honored throughout time for its myriad of beneficial properties. Uses of Turmeric can be sketched back to the Vedic culture in India, 4000 years ago, where at first it was used for culinary purposes and also enjoyed a reputation of religious reverence. Owing to its bright, yellow color it is is often referred to as the “Indian Saffron”. You would be surprised to know that an ancient Indian physicist Suśruta, who wrote a comprehensive Sanskrit text in 250 B.C on medicine and surgery, quoted turmeric as a key ingredient in treating food poisoning! Ayurvedic healers used turmeric as a medicine which was ingested in the form of juice, turmeric tea, powders, or applied topically as ointments, creams, paste etc. A variety of ways developed over time of how turmeric could be incorporated into our lives for curing common ailments. One of the most common ways was to boil milk with turmeric, sugar and to use this concoction to cure a common cold and flu. 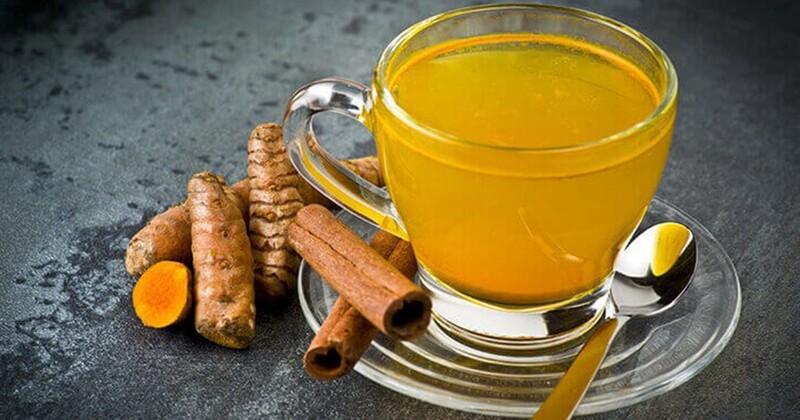 Another common way of reaping the endless benefits was to boil turmeric tea with ginger.It was also common to ground turmeric into a fine paste and to apply it topically on open wounds, bruises, and injuries to heal them. If one had inflamed joints, a paste of turmeric, lime, and salt was used to reduce the inflammation and also on sprained ankles. In fact, burning turmeric and inhaling the smoke was also considered to be extremely beneficial in clearing chest congestion and to release the mucous. Ancient healers also used a paste of turmeric and tulsi (basil) leaves to cure a variety of skin diseases and conditions like eczema, itching, ringworm, parasitic infections etc. 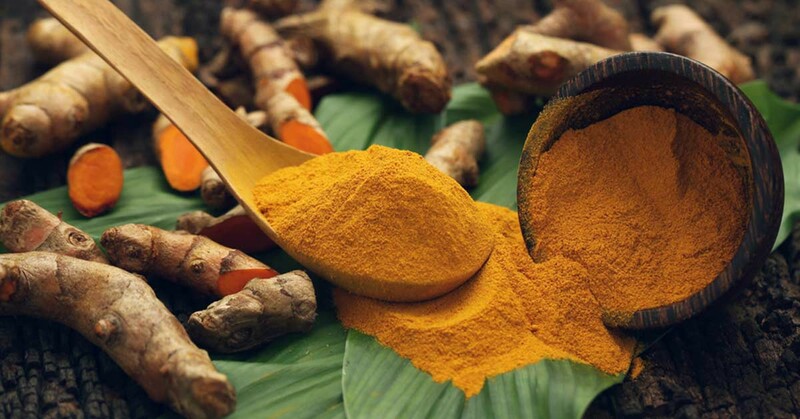 Other than this, Susruta’s text also talks of turmeric being used as a key ingredient in a herbal concoction for treating jaundice, respiratory disorders like bronchial allergies and asthma. These were in addition to a dozen other uses for turmeric in Ayurveda. Additionally, Unani medicine practitioners also used turmeric to expel phlegm and to dilate blood vessels for better blood practitioners. The second most common use of turmeric was to incorporate it into daily cooking to help with digestion, bloating, and also to offer a rich color to the food being cooked. Turmeric was also actively used in the production of dyes and in religious ceremonies as a symbol of purity and prosperity. 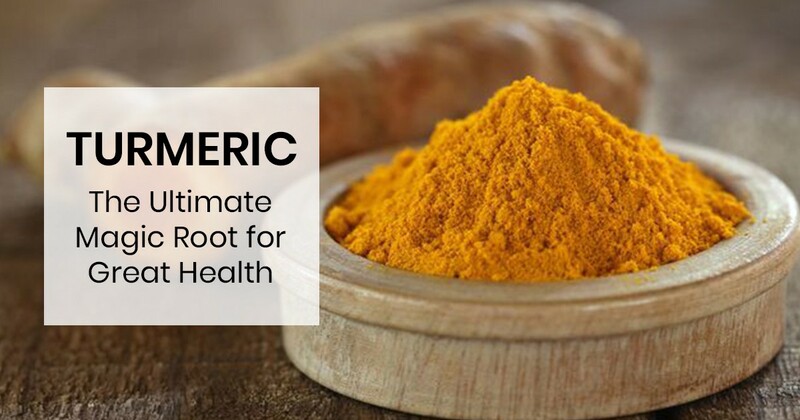 In addition to certain volatile oils, the main active ingredient in Turmeric is ‘Curcuminoids’ that contains ‘Curcumin’ which are natural anti-oxidants. In raw form, turmeric only contains around 2.5%- 3% of curcumin. It is the compound that is the key player behind the medicinal properties of turmeric. It has powerful anti-inflammatory effects and is a very strong antioxidant that neutralizes free radicals in the body and boosts immunity. In addition to this, Turmeric also contains a variety of minerals like calcium, phosphorus, potassium, sodium etc. among others. It also contains some amounts of dietary fiber, sugars, and protein. 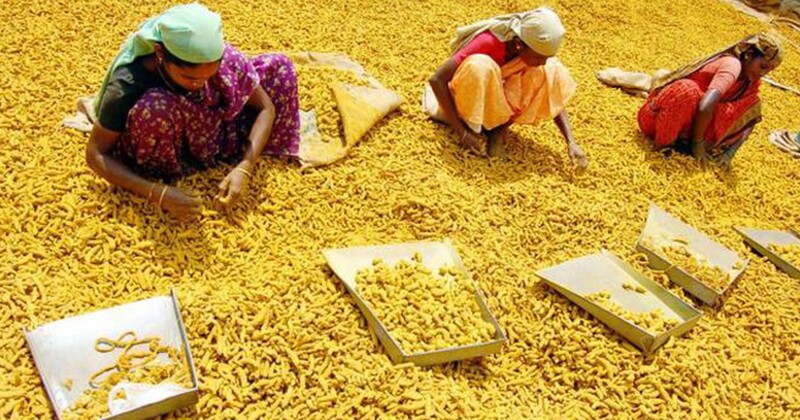 India produces nearly all of the turmeric in the world, accounting for a whopping 94% of the produce. The country also consumes 80% of it as well. Though turmeric is indigenous to Southeast Asia, it has been used and cultivated in India. 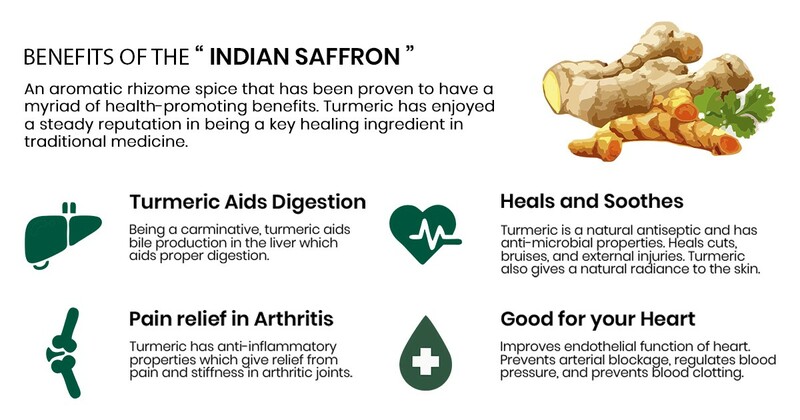 Owing to the fact that turmeric has been used for thousands of years in traditional health remedies and a culinary spice in everyday cooking in the country, Indian Turmeric is considered to be of utmost quality in the world. Owing to the consistent rainfall and the warm climate of the peninsular region, certain states in Southern India are the leading producers of turmeric. The state of Andhra Pradesh currently is the largest producer, followed by ‘Erode’, a city in the Southern state of Tamil Nadu in India, which is the world’s second largest producer of turmeric and also a significant trading center for the spice. Next in line to Tamil Nadu, the western state of Maharashtra is also one of the largest producers of turmeric. This wondrous root traveled from India to China by 700 A.D, East Africa by 800 A.D, and West Africa by 1200 A.D. It slowly started to gain popularity in the west. Courtesy of the Arab traders, turmeric was introduced in Europe in the 13th century. It has finally been recognized by Modern medicine in the last 25 years wherein thousands of publications came forward speaking of this medicinal root and what effects does it have on animals and humans. Scientists have just begun to understand the importance of the active ingredient of turmeric called ‘curcumin’ in treating modern day diseases. Borrowing from this traditional knowledge, our master blenders have curated a line of healthy turmeric teas! Turmeric has proven to be a great carminative, that calms down an upset digestive system Since centuries, turmeric has been used to aid digestion as well. It stimulates bile production in the liver, which adds to the body’s ability to digest fats. It works well to strengthen the stomach, reduce bloating in the stomach, and gastrointestinal problems. Typically, turmeric tea with ginger is used to improve metabolism and digestion. Turmeric has been used in Ancient Ayurveda and in traditional Chinese medicine to provide pain relief in arthritis. Turmeric’s active compounds have been known to block inflammatory cytokines and other enzymes. It reduces the inflammation and stiffness in joints and hence provides significant pain relief to people suffering from osteoarthritis or rheumatoid arthritis. As discussed above, the tradition of using turmeric as a key ingredient for healing common ailments and small injuries. Turmeric is a natural antiseptic and is a very effective external antibiotic that prevents the build-up of bacteria in wounds and injuries. For small bruises, minor cuts, and external injuries, one can apply a topical paste of turmeric on the affected area to speed up the healing process. Owing to the anti-inflammatory properties of turmeric, it is also very helpful in reducing surgical pains and related inflammation. 4.Turmeric nourishes and heals skin. Turmeric, as an effective disinfectant, is also known to heal skin ailments and nourish it as well. Applying turmeric topically on the skin helps in treating many skin ailments like acne, blemishes, rashes etc. In India, it is a common practice to use a blend of turmeric and honey to increase the natural glow of the skin. Owing to its antimicrobial properties and detoxifying abilities, turmeric can aid the cure of a variety of skin diseases like eczema, psoriasis, and acne. Turmeric has been proven to improve the endothelial function of the heart which regulates blood pressure, blood clotting, and proper cardiac functions. The active ingredient present in turmeric, ‘Curcumin’ inhibits the oxidation of LDL Cholesterol (bad cholesterol) and prevents Atherosclerosis, which is the deposit of cholesterol on the walls of the blood vessels of the heart. Turmeric also prevents platelet buildup along the walls of injured blood vessels, which would otherwise lead to blood clots and arterial blockage. Our Turmeric tea tisane is mixed with a variety of health-promoting spices like black pepper which enhance the effects of curcumin by 2000X! Here’s all you need to know about the fascinating health benefits of Turmeric! With a heady aroma and a myriad of health-promoting benefits, VAHDAM shares this passion for ‘Turmeric’. Our master blenders have toiled hard for days at an end, to bring you the very best of Turmeric Teas. 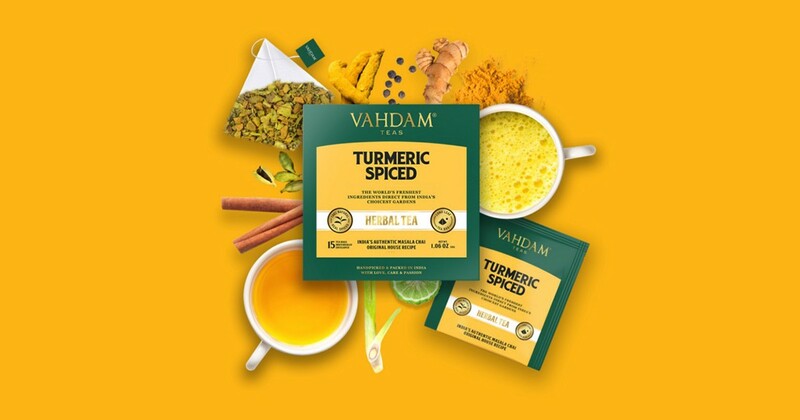 As a customer, you would be elated to know that VAHDAM only sources prime quality turmeric from the southern states of Tamil Nadu, Kerala, and Andhra Pradesh which are renowned for their turmeric produce which is of the utmost quality. Vahdam brings you flavorsome and herbal Turmeric teas which not only bring you a token of good health but are also a treat in themselves! Our Award-Winning Turmeric Spiced Herbal Tea Tisane Tea Bags was declared as the ‘2018 New Product Winner’ under the Hot Beverages category out of a whopping 2600 entries by the Specialty Food Association (SOFI). Gratify yourself with our sprightly and zesty turmeric tea with ginger! Our Turmeric Spice Herbal Tea Tisane is a lively feast in itself that brings together the best of sun-dried turmeric with the warm flavors of freshly-ground, aromatic Indian spices like cardamom, cloves, and black pepper. You would be delighted to know that when turmeric is combined with black pepper, the scale of absorption of curcumin in our bodies goes up by 2000 times, which means that you get a cup of wholesome turmeric goodness! Also, ‘Turmeric Latte’ or popularly known as ‘Golden Milk’ has garnered a stable reputation in the west for being a low-caffeine and extremely healthy drink! Millions of Indian households, since centuries, have turned to a turmeric latte for boosting their immunity, clearing chest congestion, beating common cold and flu, to cure gastrointestinal problems and much more! One can find tons of recipes online for making a cup of turmeric latte, which not only has a much lower caffeine content ( which means no caffeine jitters) and which is an excellent detox drink to start your day with! Life will always be a hustle! There will always be things which are out of your control. But there are aspects of your life that you can take charge of. Start treating your body with a lot of love and kindness. Start with Vahdam!